Reviving Home’s founder, Abdulhadi Soufan with Google Launchpad Mentor and Entrepreneur Steve Nitzschner and Reviving Home’s Jennifer Roberts. Serial entrepreneur and head of the boutique fund WSN Angels & Startups Steve Nitzschner wants you to forget the new Berlin cliché of the “startup hipster” and cast a light on the growing heart of Berlin’s startup scene, the ambitious refugee and immigrant entrepreneurs being mentored as part of Google Launchpad’s renowned startup mentorship program. Known for co-founding ventures designed to do-good for communities, like US-based volunteering app Kindly and European childcare-search platform Little Bird, Steve combines smart tech with what people and communities need most. 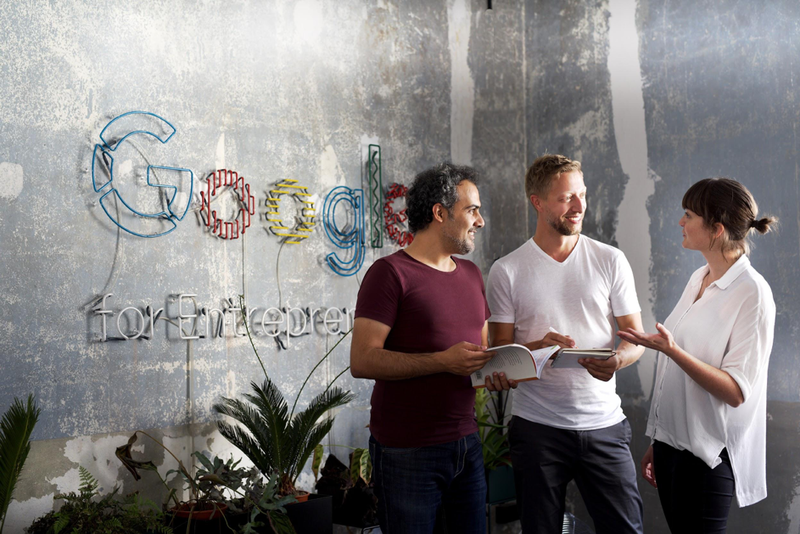 He put his knowledge to the test alongside other Berlin-based entrepreneurs, like Dirk Lehmann, by taking part in Google Launchpad Berlin’s refugee-focused mentoring session. He may have arrived to share his knowledge, but he learned a few things from the session too. Steve took five minutes to answer 5 questions on how his latest Google Launchpad experience is shaping his worldview and the entrepreneurial landscape in Berlin. How long have you been a Google Launchpad mentor and what does it usually involve? I’ve been a mentor since 2015, and first started mentoring of startups in Munich where I helped fashion, health and fitness startups refine their business models as well as develop their UX. Since then I’ve met and helped startups around the world. The Google Launchpads in Tel Aviv and Munich let me share my experience solving digital challenges in diverse tech areas like commerce, robotics, housing, health, social impact, media and artificial intelligence. This past September your session was a little bit different, these weren’t just a fresh batch of new entrepreneurs, these were refugees from Syria. There were two startup founders with immigrant backgrounds that needed I was able to help directly– BOTE is a smart assistant for parents to help them keep a close eye on their small children so they can keep them safe and have peace of mind. It is a device that is attached to a kid`s shoelace and is wirelessly connected to the parent`s smartphone. Their CEO, Rafat Hantoush, is currently fundraising and we discussed alternative ways for him to achieve his goals as well as how to structure his deal with a VC from Asia. Reviving Home, the founder in the image above, is a non-profit org that designed a process to help displaced people to revive and rebuild their war/crisis torn-homes with under $5,000. Reviving Home’s founder, Abdulhadi Soufan, is an architect and fled Syria for Berlin in 2015. Since then, he’s developed a process and network of builders to help locals in Syria to rebuild their war-torn homes. I was lucky to find that they came to the table with an open-minded founder and advisor at the core of their team. Although they didn’t come with a deep tech background, they were able to understand how to limit their pitch and create a doable mission rather than a larger-than-life vision for their venture. What motivated you to take part in this special project? Over the past several years, I have made several trips to and collaborated with organizations in Lebanon, the Westbank, Gaza, Greece and Germany and was able to experience so many different world views and experiences. My team and I always try to turn these experiences into a chance to deliver some help to where it’s needed. Past experiences like travelling to the Syrian border and understanding more about the local conflicts and helping build a first responder station and camp in Lesvos, Greece widened my view of the world and entrepreneurship. I realized how important it is to support the entrepreneurial potential in refugees. Do you believe their refugee experience informs or inspires the ventures they are trying to form? The energy and entrepreneurial spirit of these founders really surprised me. They attacked every problem with the right amounts of steam and passion. Honestly, sometimes this is what I miss in local founders who think that they just have to build a product and the success will come. It’s hard to continuously work to deliver a mission and even harder to deliver a vision! As an experienced entrepreneur and tech consultant, what did you learn from the new entrepreneurs you are mentoring? I especially learned from Reviving Home’s Hadi, who taught me that even a process can already become a venture. Although there’s no technology involved, you have to understand the foundation of a venture and add technology to the process later on. Hadi’s foundation was to build teams in Syria and understand the scale of a war-torn home. Now he’s making plans to rebuild not just a particular home but also other homes with the same level of destruction. The tech solution will come later, once he’s proven that the process works at a “manual scale”. What role do you see refugees playing in the future of the already thriving Berlin startup scene? I believe that the immigrant and refugee experience will add so much to the European economy as a whole. I see these refugee entrepreneurs inspiring others to go on an entrepreneurial journey and give even more back to Berlin or whatever city they start out in. I see Google’s Launchpad program as a perfect springboard to foster the entrepreneurial spirit these people bring to the city. With their toolbox and employee commitment to help people in the community and beyond, Google wins twice: they give back and get to involve their engineers and managers in projects that see the world with different eyes. You can apply and learn more about the Google Launchpad program here. Berlin-based writer and communications professional.